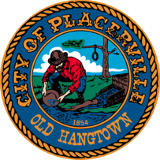 The Placerville Police Department Property Section receives, processes, stores, and maintains an inventory of: evidence, items found, and items for safekeeping. We maintain detailed and accurate records for chain-of custody of all items through final disposition. Call for an appointment. Have your Report Number available. 8:00am to 5:00pm by appointment only. The District Attorney's Office has cleared the case. The Placerville Police Department Detectives have cleared the case. Evidence includes items of property which have some connection to a crime. Because items booked as evidence may be used during the course of a criminal trial. Items held as evidence are usually retained until the prosecution of the criminal case has been concluded on all parties involved in the case. Approval may be required from both the El Dorado County District Attorney's Office and the police detective assigned to the case before property can be released. Safekeeping items are those held for the owner for various reasons and are not intended to be used as evidence in a criminal case. The owner has 60 days to claim the items once he/she has been informed in writing that the items can be released. Unclaimed items are disposed of in accordance with California law. All illegal weapons, ammunition, drugs or narcotics which are confiscated, found, or otherwise turned into the Placerville Police Department will be destroyed. Weapons turned in or taken for safekeeping due to a domestic violence incident or an incident where the person is taken in for psychiatric evaluation may be retrieved when certain conditions are met and after receiving clearance from the California Department of Justice (DOJ). Firearms can only be released after a background check has been completed by the Department of Justice and the fee has been paid. The Placerville Police Department also has a Gun Release Fee of $50.00 for each firearm that can be released. You will receive a letter from the Property Officer with a DOJ Firearms Release Application and any other information that you will need. Items held for safekeeping, found property, recovered, and cleared stolen property are released to their owners, upon proof of ownership. If unclaimed, these items are eventually sold at auction. Some items in dangerous or unstable condition will be destroyed. If you have found property within the city limits of Placerville, please call the police as soon as possible. Found items may not be lost, but may actually have been stolen or involved in the commission of a crime which police may currently be investigating. Found property can be turned over to any police officer or brought into the police department. If you find property outside of the city limits of Placerville, please call or go to the police department or sheriff's station in the city or county where you found the item and turn it in there.